The Lamy Joy Calligraphy Fountain Pen is a black resin pen that comes in nib sizes of 1.1, 1.5, and 1.9. The pen is packaged in a red cardboard box with a plastic sleeve. It comes with one blue Lamy ink cartridge. The design is sleek with only the red stainless steel clip, the red finial, and the red tip on the bottom of the pen as accents. But, boy do those accents pop! Although there are two ink windows, they are embedded deeply in the barrel and the cartridge is so dark, it’s difficult to tell how much ink is left in the cartridge. The cap snaps on and off and can be posted. Lamy is lightly enscribed near the bottom of the barrel. The barrel itself has two flat sides and two rounded sides. If you use the pen unposted, the flat sides of the barrel will keep the pen from rolling off your desk. The pen is longer than average fountain pens, measuring 179mm capped, 169mm uncapped, and 176mm posted. But it is quite light, weighing only 11 grams unposted. The Lamy Joy comes with one blue ink cartridge, but you can purchase a Lamy converter if you wish to use bottled ink. Like Lamy Safari pens, the Joy has a triangular-shaped grip meant to keep your fingers in the proper position. Some people love this grip, others (like me) don’t. It’s a matter of personal preference. This pen has the 1.1mm nib. 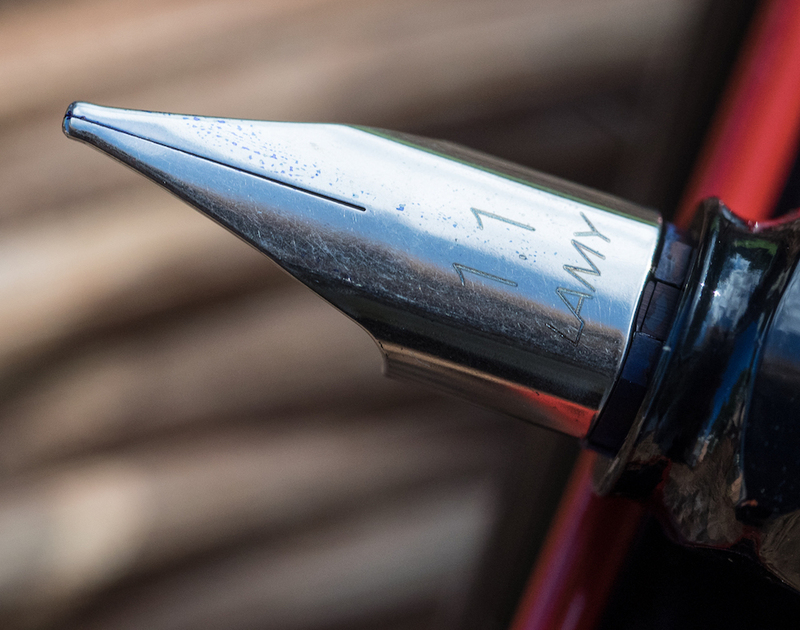 It’s a stainless steel nib and, in typical Lamy minimalist fashion, it is unadorned. It bears only the nib size and the Lamy name. So, how does it write? Well, I’m no calligrapher, but I do use italic nibs quite often, and this nib is, after all, a 1.1mm italic. I found it to be adequate in terms of wetness, though I like my nibs much juicier. However, it isn’t a smooth nib. I’m not sure if the tines are slightly misaligned or if there’s some tipping material causing the scratchiness, but it feels like the nib is digging into the paper on every stroke. In other words, my writing experience was not pleasant. Perhaps a bit of micromesh would fix the problem. In any case, I wrote a couple of test pages, and the 1.1mm offered some line variation and shading with the Lamy blue ink. 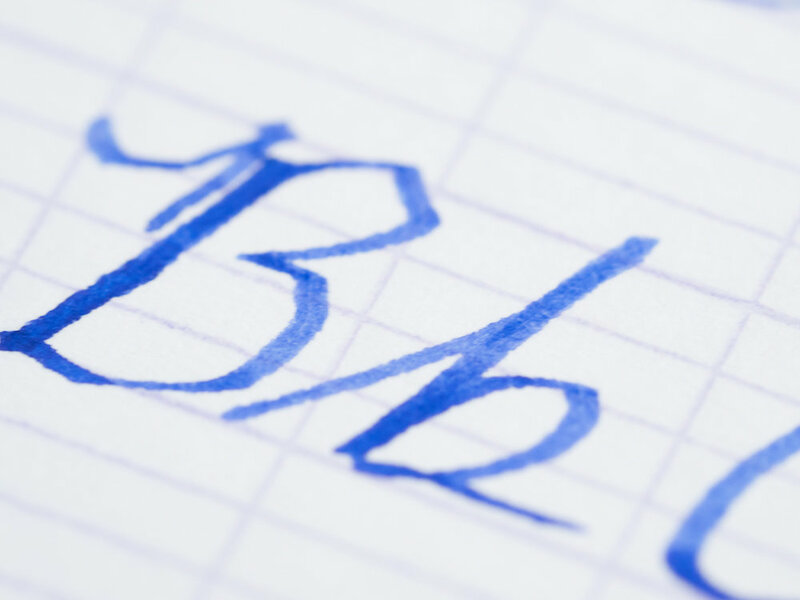 For calligraphy, I would suggest choosing the 1.5 or 1.9 size nib since the 1.1 seems a bit narrow. Neverthless, for everyday writing, the 1.1 nib is a good choice as you can see with the following writing sample. You can purchase the Lamy Joy from Pen Chalet for $28.00. The converter is an additional $4.70. At $28.00, the Lamy Joy is quite a bit more expensive than other plastic calligraphy pens, such as the Pilot Parallel ($8.00 at JetPens). Granted, the Lamy Joy looks much nicer than the Pilot Parallel. But if you’re wanting a decent calligraphy pen for a good price, the Pilot Parallel pens are excellent. I own the 1.5mm and the 2.4mm Pilot Parallels and both nibs are smooth. The Lamy Joy is a sleek resin calligraphy pen. The red accents make the pen pop. The pen is very light, so it is easy to work with during long writing sessions. It sports a grip that many users find very comfortable. I honestly think the Lamy Joy is overpriced at $28.00. Although many people like the triangular grip, I find it inhibiting. I tend to rotate my pens a bit when writing, so I feel like I have to fight the grip on this pen. The nibs on Lamys can be hit or miss. This steel 1.1mm nib was scratchy. Posted on October 6, 2017 by Brad Dowdy and filed under Lamy, Fountain Pens, Pen Reviews.